It’s hard to believe that it’s April again, and that means our annual jaunt to Italy. Along with 350,000 other design obsessives, team Curve arrived in Milan on Friday afternoon and immediately hit the ‘Fuorisalone’ heading down to Tortona and the Temporary Museum for New Design. Some highlights included Studio Job & NLXL, Moooi and Lasvit lighting. We had a fantastic evening out with one of our suppliers in Porta Genova enjoying the city’s amazing atmosphere. Despite our very late Friday night we managed to get ourselves to the Salone as it opened on Saturday morning, ready for a full on day of furniture hunting. We caught up with lots of our favourite brands as we made our way around the halls, picking up inspiration for lots of on going projects – from design classics, new innovations, upcoming trends, and way out ideas. Curve are underway with a really diverse range of different style projects this year so it’s great to have so many varied suppliers to look at. Our favourite stands included Kartell’s golden creation, Missoni Home (as always), Munna, Boca do Lobo, Visionnaire, Tom Dixon, Gallotti & Radici, BD Barcelona and Kose. Some of the key trends we spotted this year were a continuation of soft pastels such as pink and mint, but an explosion of brighter colours especially red and orange. We saw lots of metallics in brass, copper and more smoky colours. And lots of interesting ways to use plants, such as hanging plants and living walls. There were also an awful lot of cool tea pots around, many of them bringing an Eastern influence. Ben couldn’t wait to take a look around Salone del Bagno, to gain ideas for our ongoing bathroom projects, we are underway with designing around 30 at the moment so it was good to see what our favourite brands had on show, as well as picking up a few new contacts. We loved bath taps that attach and fill the bath right from the ceiling, a light which is also a shower, gorgeous rose gold taps and showerheads, and Catherine particularly liked a massive purple shoe bath! By the time the fair closed at 6:30 we were all ready for a well deserved Magnum and a glass of prosecco while we waited for the queue for the train to calm down a little bit, this refreshed us enough for another night out, this time in Brera where we enjoyed a few Aperol spritzers as the sun went down. Our Sunday morning got off to the perfect start with a leisurely visit to our friends at Paola Lenti, exhibiting again in the wonderful surroundings of the Chiostri dell’Umanitaria. We enjoyed catching up with lots of exciting new indoor and outdoor products before being treated to an amazing lunch in the sunshine. Before our flight back to Manchester there was plenty of time to take a look around more of Salone Satellite, in the city centre this time, visiting lots of the showrooms and fashion shops. We took in Edit by Design Junction which is always excellent and met some great independent designers there. Curve place a great importance on nuturing our youthful and talented designers! This year we took Georgie and Catherine to Milan, who both found it a fabulous experience, learned lots and came home with heads full of ideas for their project work in the studio. Curve love German furniture manufacturer Schönbuch. 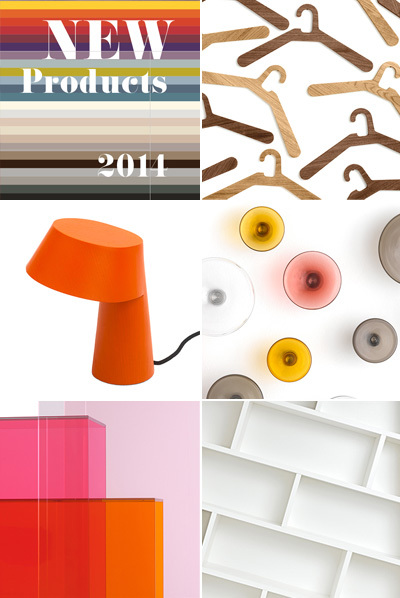 Here are some bright ideas from their brand new 2014 collections, great for hallways, storage, quirky coat hooks and creative interior accessories.